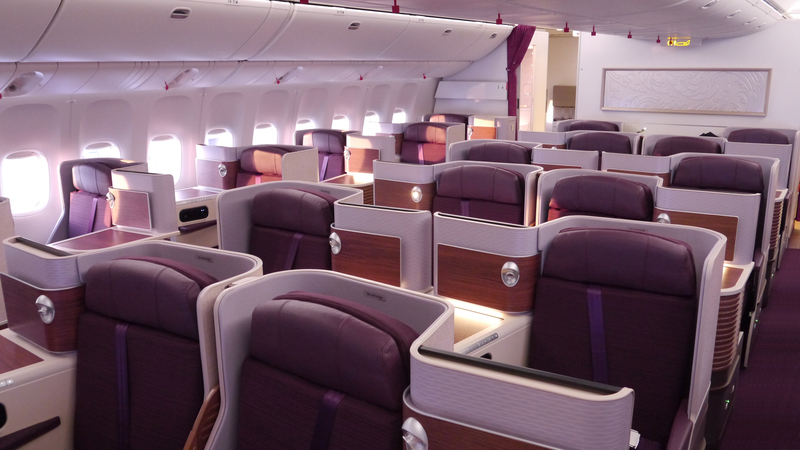 Thai Airways may have had the current staggered Sogerma Solstys seat arrangement on their 777 for a little while now, but the airline has finally invested into created a more customised and exquisite cabin concept. Designed by Priestmangoode, this is the 3rd announcement in as many weeks for the UK based consultancy. 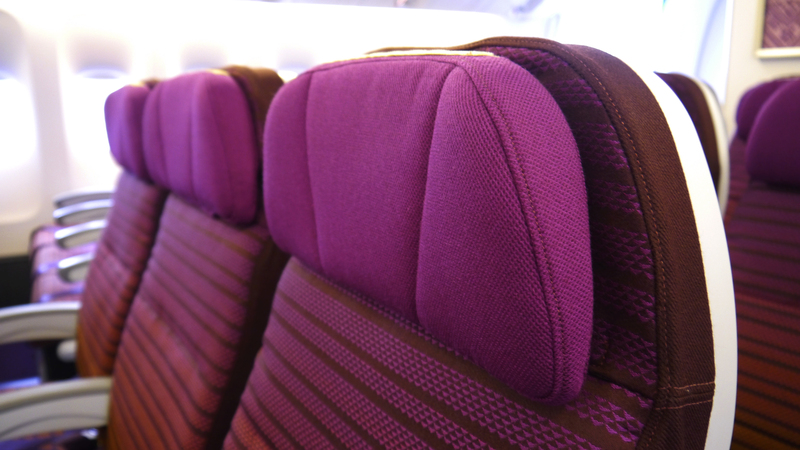 This is an extension of a larger programme to redesign the interior identity of the Thai Airways fleet, which started in 2013 with the release of the new Royal First Class cabins for the national carrier. Priestmangoode is currently designing a collection of ‘Thai Contemporary’ custom interiors for application on different aircraft types. The new finishes on the already installed seats, are refreshing to see, and offer a much more sophisticated and grounded finish. Long gone the previous very plastic looking seat forms, and the new textures and prints found in the soft furnishings are a lot more luxurious, and less likely to date so quickly. The use of wood also adds warmth to an otherwise cool and reserved cabin concept. The new Royal Silk Class cabin features bespoke materials including Thai teak wood, vertical silk foil and rattan on the seat shell creating a warm cabin environment. The seats now feature a custom designed reading light and redesigned seat controls so as to be more intuitive and ergonomically placed. More space is available per seat using simple space saving elements such as a flush mounted entertainment handset, reduced monitor depth and a table hinge that has been moved to create more leg space for passengers and be better integrated within the seat furniture. As for privacy, subtle changes to the seat offer extended privacy from your next door neighbour. The cabin bulkheads now feature a brand panel with bespoke artwork by Thai artist Panya Vijinthanasarn and the entrance to the cabin now has a panel with a 3D THAI logo to increase brand presence in the cabin. 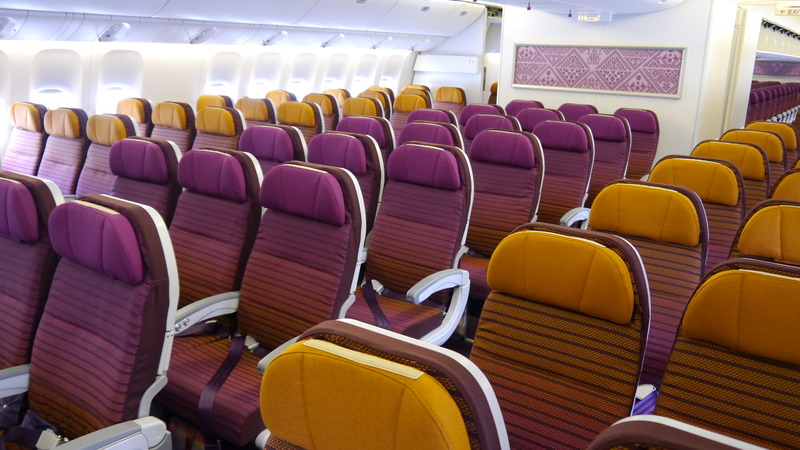 The most evident elements though, and the biggest in setting the tone for the cabin design include a teak louvre ottoman that ‘references contemporary Thai design’ and gives the seat a truly unique identity differentiating it from the standard Solstys seat. The new Economy Class was inspired by the energy and vibrancy of Thai street markets. Tones of oranges and purples on seats and curtains were used with metallic yarns to reflect the iridescent effect of traditional Thai silks omnipresent in local street life. Patterns on bulkheads and seat fabrics were specially designed to reflect the geometric patterns found in Thai culture – such as in the ubiquitous triangular floor mats and iconic temple roof tiles. The bulkhead itself incorporates a feature panel with bespoke fabric designed by Thai artist Panya Vijinthanasarn. This focal point in the cabin pays homage to the intricacy of traditional Thai textiles. 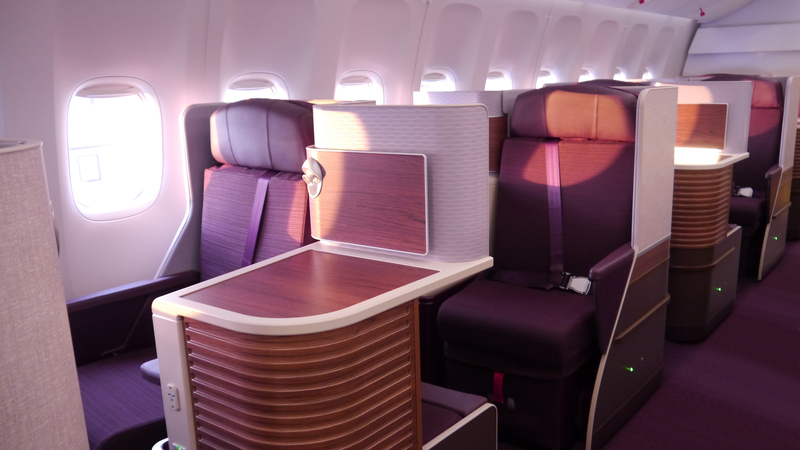 Priestmangoode’s signature style is apparent in Thai Airways’ new 777 cabin interior, and this is yet another airline cabin presentation that is sympathetic to the design ethos of the carrier’s country. 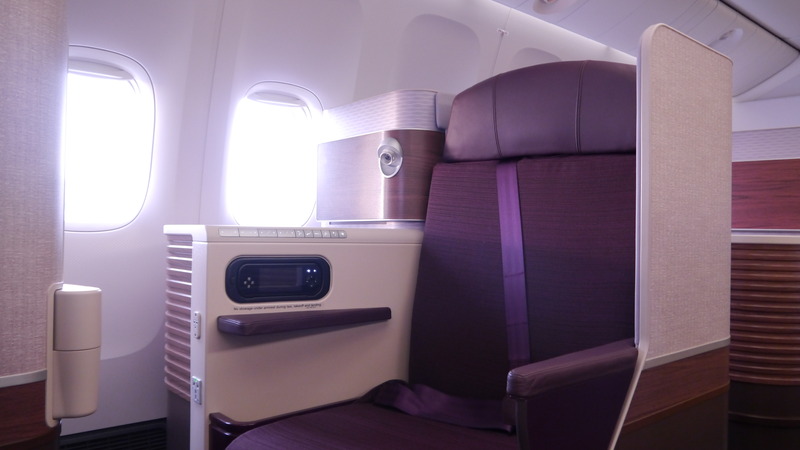 It also ties in beautifully with the new first class cabin for Thai that Priestmangoode revealed last year. We are pleased that the carrier is investing into their product and making it a world leader on an international stage. It’s the details we love here. Looking forward to seeing it in real life!